One company is sitting on several multibillion-dollar franchises, and it's trading near lows investors haven't seen in a while. Despite their age, Minnie and Mickey are as popular today as they've ever been. Image source: Disney. 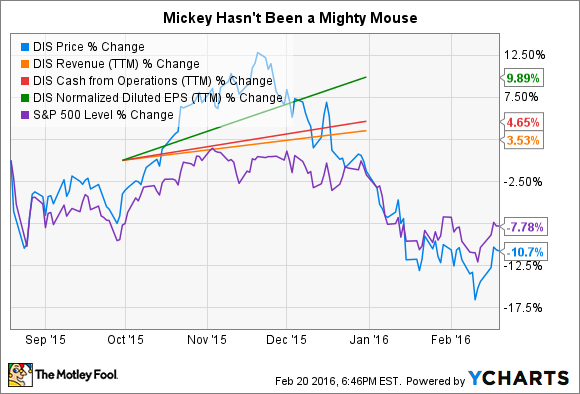 Walt Disney (NYSE:DIS) stock has let me down recently. Nevertheless, I'd buy more -- right now -- if the company weren't already responsible for 28% of our family portfolio. Actually, check that. I may still buy more, if I find good reasons to sell other holdings and raise funds to add to our position in Disney stock and options. Franchise firepower boosts margins. Take a look at the history of Disney since the 2009 Marvel acquisition and you'll see huge improvement in two key areas. Specifically, operating margin at the Consumer Goods & Interactive and Studio Entertainment divisions have multiplied more than 3.5 times and 10 times, respectively, since fiscal 2009. That's what you get when new properties bring in new fans. Improving cash flow and a history of dividend increases. Cash from operations has more than doubled over the same period -- from $5.32 billion in fiscal 2009 to $11.42 billion over the trailing 12 months. Better still, Disney has managed to consistently raise its annual dividend payment while making bigger investments in its parks and expanding its franchise ambitions. Those who held shares last year were paid $1.37 per share for the privilege, a 19% increase over Disney's 2014 payout and nearly four times what the House of Mouse paid investors seven years ago.